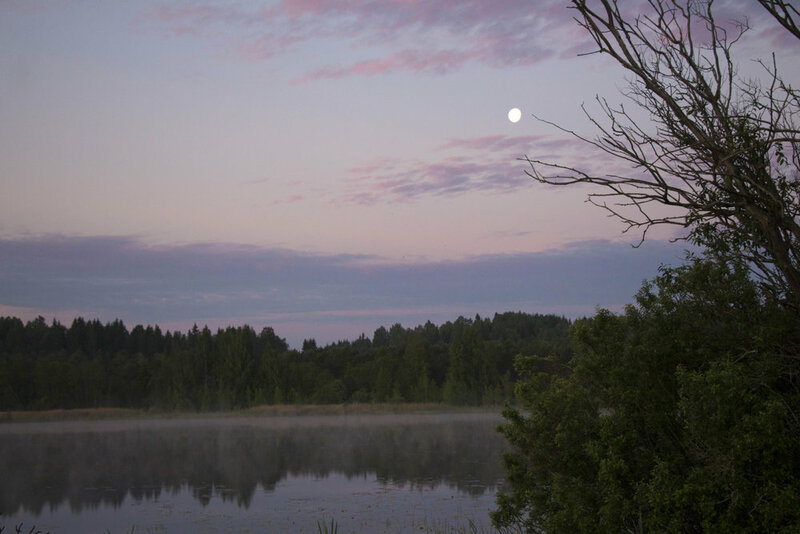 As the heat of the day settled into the coolness of the evening & then (after what seemed like only moments later) crossed over into the Finnish morning, a hovering mist formed over a mysterious lake. The Misty Mirror emerged from the depths of a translucent blue darkness in the silence of the colorful early dawn. This place of still & quiet reflection created a magical shroud within which the first chapter of Augmented Organism was birthed. The dawn sky and the clouds, the shrouds of mist & the sky reflected on the lake converged into a birthplace where heaven & earth were mirroring each other. Even though the heavens and it’s reflection present themselves as a duality of sorts in this landscape there was a palpable sense of something beyond duality, a quiet and fresh knowing. The waters also clearly spoke to us of the womb of life, the waters from which life emerges. An intrinsic part of our mythological mapping during the Augmented Organism Project incorporated various roots of European fairy folklore. For Misty Mirror the characters & energies we worked with spoke to the environmental setting of this chapter. The two sisters Laiste (the moon's daughter) & Losguna (of the murky depths) were a strong presence. The archetype, the Maiden, was also a building character found in this section (please refer to Sky Dance for more information on her). The Pangu legend from Chinese Mythology in which formless chaos collected into a cosmic egg that held the opposed principles of Yin & Yang in balance & which then from Pangu's axe, broke into sky & earth. In addition to our main research areas, our main elemental focus for Misty Mirror was water. Water became an essential element to the story's beginning - a mysterious message arising from the natural Finnish environment. 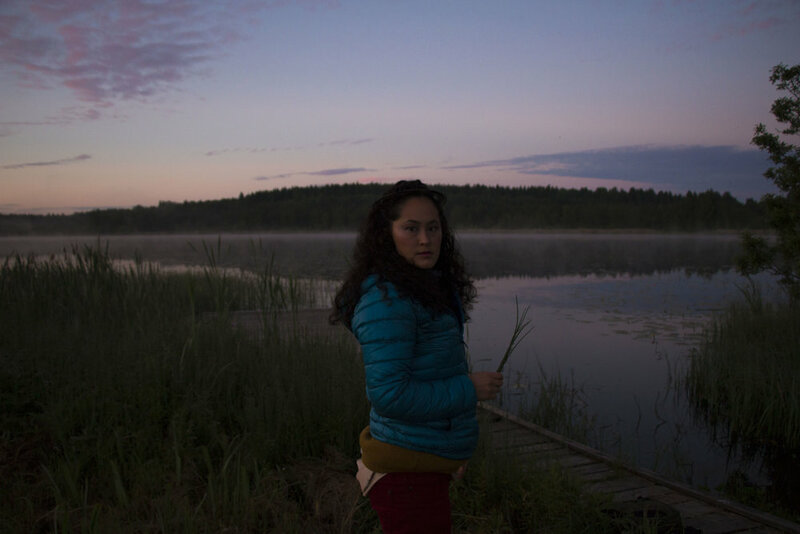 We visited this particular lake location multiple times for research, archiving audio field recordings, noting weather patterns, planning cinematography & choreography as well as various ways of integrating all of these factors. The Misty Mirror shoot happened between 2am - 5am in the morning after finishing a full day of location scouting & test shooting at 11pm the previous night. The biggest lesson with Misty Mirror was that working with the environment to capture the quintessential mood was crucial & ultimately SO worth it. The general characterization, costume concepts, overall energy & effort of movement for Jazmyne was established from previous research & rehearsal times at the lake focusing on extremely slow and intentional movements - a stylised aspect of Cy's movement/choreographic direction style. For Misty Mirror, after 3 consecutive days of visiting the site the perfect conditions were outside -- Jazmyne jumped into makeup, picked up the pieces calling to her on the top of her costume drawer, & Cy grabbed all the audio and visual tech equipment as they headed out on bikes with backpacks. Misty Mirror took only one take from the moment Jazmyne stepped into character as the Augmented Organism experiencing its environment for the first time. "A moment that is most memorable, was the time of the misty cloud — the misty mirror. A 3am moment that could not be passed by. Above the lake there was a low lying mist, resting just above the lake and just below the blue, pink, purple sky. The lake, still, glossy, seemed frozen and cold at a distance, receiving the whiteness of the clouds in its reflection. These low lying clouds of mist slowly moved across the lake, like a ghost on its path. Peaceful, and hauntingly beautiful the clouds to me represented the spirit, the mass that could be moved and dissipated, one that could hover above, around and through the body— the water. The dreamlike mind to me is the sky, completing the trinity of mind, body and spirit all present in one moment, able to be seen by the naked eye. The setting also had a sense of intimacy, that I felt honored to watch and be present to see. It was the coming together of sky and water, to create a creation called Misty. It was as if something new and pure in those blankets of white were being born— something coming into being. We were lucky to capture that moment, with dedication to brave the cold and fatigue that comes with a long day and being awake at the wee hours of 2-5am."